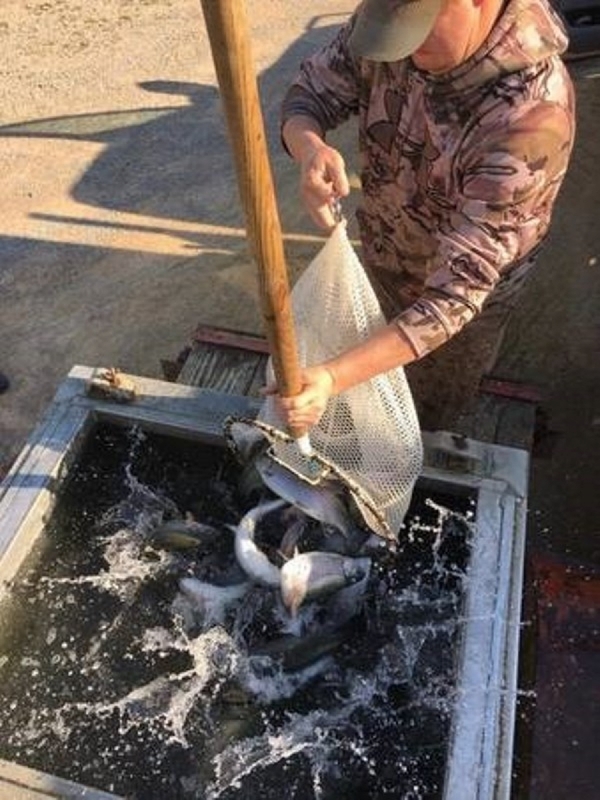 The last trout stocking of the 2018/19 trout season occurred at the Blue River Public Fishing and Hunting Area on Tuesday, March 19. Approximately 3,000 trout were stocked in all areas except the catch and release zone. Spend you spring break reeling in trout with family on the Blue River. Broken Bow: March 15. Elevation above average, water 53. Largemouth, smallmouth, and spotted bass good on crankbaits and grubs around brush structure and points. White bass fair on grubs, in-line spinnerbait, and jigs around channels, creek channels, river channel, and river mouth. Report submitted by Dru Polk, game warden stationed in McCurtain County. Eufaula: March 15. Elevation normal, water murky. White bass fair on sassy shad, small lures, and tube jigs around creek channels and tailwater. Crappie good on minnows, small lures, and tube jigs around brush structure, river channel, and standing timber. Blue and channel catfish good on chicken liver, cut bait, and shad around channels and flats. Report submitted by Jake Bersche, game warden stationed in McIntosh County. Hugo: March 15. Elevation above average, water 49 and murky. Blue, channel, and flathead catfish fair on cut bait, dough bait, live bait, and shad below the dam, and around the main lake, and river channel. Crappie good on jigs and minnows below the dam, and around brush structure, channels, main lake, river channel, and standing timber. Report submitted by Andrew Potter, game warden stationed in Choctaw County. Konawa: March 14. Elevation normal, water 46 and clear. Largemouth bass good on crankbaits, lipless baits, and plastics around the main lake, points, river channel, and weed beds. Striped bass hybrids and white bass fair on Alabama rig, crankbaits, and live shad around coves, main lake, and river channel. Channel catfish fair on chicken liver, cut bait, and stink bait around coves, creek channels, riprap, and weed beds. Report submitted by Garret Harley, game warden stationed in Seminole County. Lower Mountain Fork: March 15. Elevation normal, water clear. Rainbow trout good on nymphs, PowerBait, and worms below the dam, and around creek channels and spillway. Report submitted by Mark Hannah, game warden stationed in McCurtain County. Lower Mountain Fork: March 19. Elevation normal. Rainbow trout fair on PowerBait around river channel. Stocked approximately 1,400 rainbow trout on March 13. Report submitted by April Drake, secretary at the Southeast Region Office. McGee Creek: March 15. Elevation above average, water 48 and stained. Largemouth and spotted bass good on crankbaits, plastics, and drop shot rigs around flats, points, standing timber, and deep humps. Crappie fair on minnows around creek channels, river channel, and standing timber. Report submitted by Jay Harvey, game warden stationed in Atoka County. Pine Creek: March 15. Elevation normal, water clear. Largemouth bass good on plastics and spinnerbaits around coves. Crappie excellent on jigs and spoons around coves and creek channels. Channel catfish good on chicken liver and cut bait around creek channels. Report submitted by Mark Hannah, game warden stationed in McCurtain County. Robert S. Kerr: March 15. Elevation normal, water murky. Crappie and white bass good on hair jigs, jigs, and minnows around inlets and standing timber. Blue and channel catfish fair on cut bait, dough bait, shad, and stink bait around channels, inlet, river channel, and river mouth. Report submitted by Allen Couch, game warden stationed in Haskell County. Sardis: March 14. Elevation above average, water 55. Largemouth and spotted bass fair on jigs, plastics, spinnerbaits, and tube jigs around brush structure, points, shorelines, standing timber, and weed beds. Blue and channel catfish fair on cut bait and shad around channels, flats, main lake, and shorelines. Crappie fair on jigs, minnows, and tube jigs around brush structure and standing timber. Report submitted by Dane Polk, Game warden stationed in Pushmataha County. Texoma: March 15. Elevation rising, water 48 and muddy. Blue and channel catfish fair on cut bait and shad below the dam and river mouth. Crappie fair on hair jigs, jigs, and minnows around brush structure, creek channels, and docks. Striped bass good on Alabama rig, flukes, live shad, and sassy shad around main lake and river mouth. Lake is rising from recent rains. Striped bass are being caught on deadsticking, live bait, and trolling methods. Look for clean water for best striper fishing. Crappie are below dock and brush structure in 20-30 ft. Best methods are suspending jigs colors include orange, chart, silver. Blue cats will being staging in river mouths, bait will be fresh shad whole or cut. Report submitted by Trey Hale, game warden stationed in Bryan County. Wister: March 15. Elevation above average, water cloudy. Largemouth bass good on bill baits, crankbaits, plastics, and spinnerbaits around brush structure, channels, shorelines, and standing timber. Blue and channel catfish good on chicken liver, punch bait, shad, and stink bait below the dam, and around channels, main lake, and standing timber. Crappie good on jigs, minnows, and tube jigs below the dam, and around brush structure, channels, and shorelines. Report submitted by Thomas Gillham, game warden stationed in LeFlore County.